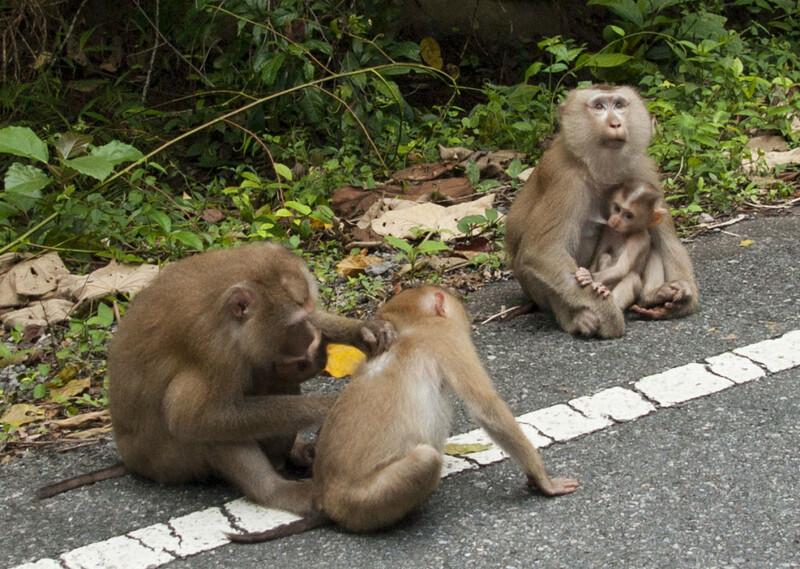 The first viewpoint of the park is at the viewpoint on km 30, Thanarat road. Khao Yai National park อุทยานแห่งชาติเขาใหญ่ is one of the popular destinations among Thai people for a short getaway including myself. It is just 3 hours drive by car from bustling Bangkok to a pristine rainforest, home to a huge array of interesting wildlife. 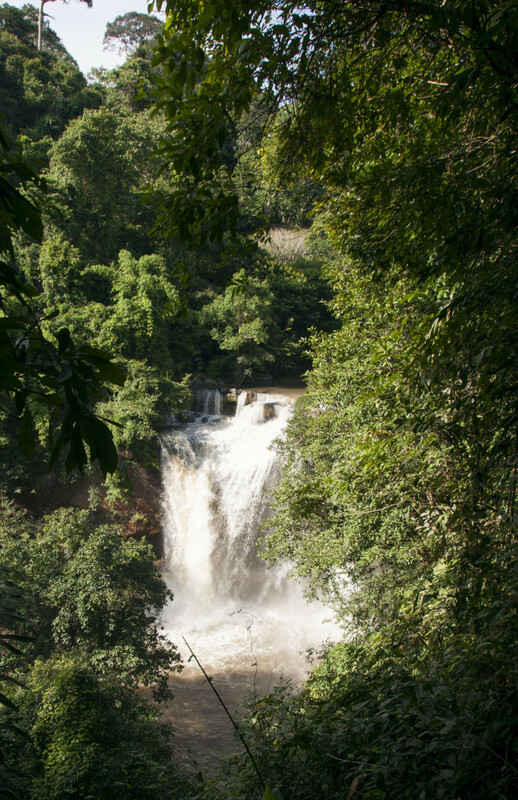 Khao Yai established in 1962, was Thailand’s first national park covering 2,168 square kilometers including evergreen forests and grasslands. The park lies largely in Nakhon Ratchasima province but also includes part of Saraburi, Nakhon nayok and Prachin Buri provinces. In 1984 the park was made an ASEAN Heritage Park, and on July 14, 2005 Khao Yai National park together with Tublan National Park อุทยานแห่งชาติทับลาน, Pang Sida National Park อุทยานแห่งชาติปาง สีดา ,Ta Phraya National Park อุทยานแห่งชาติตาพระยา and Dong Yai wildlife sanctuary และเขตรักษาพันธุ์สัตว์ป่าดงใหญ่ was inscribed as a UNESCO World Heritage Site under the name Dong Phayayen–Khao Yai Forest Complex (ผืนป่าดงพญาเย็น-เขาใหญ่). And when I arrived the visitor centre area, I got very excited even more to see three wild deers for the first time up close! They are not scared by human and just mind their own business having their lunch. After admiring the lovely deers enough and got the map of the park from a friendly staff, I headed to the first waterfall in my list. 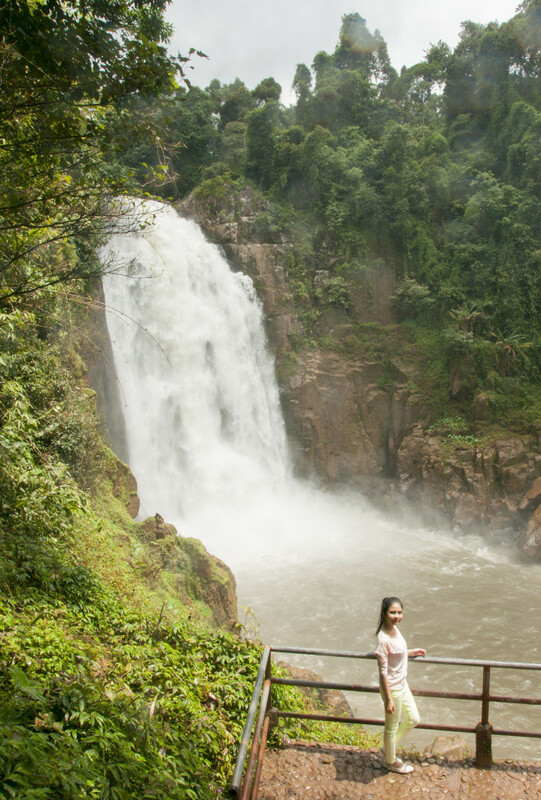 Khao Yai is famous for its many waterfalls; the most famous is the one that was appeared in Leonardo’s film “The beach” which is called Haew Suwat Waterfalls น้ำตกเหวสุวัต – This waterfall runs over a 20-meter cliff into a large pool below. I drove 13 kilometers from the gate and walked about 200 meters and saw this beautiful waterfall in front of me as well as playing with many pretty butterflies in the area. – Swimming is not allowed in this waterfall, the stream is very strong. 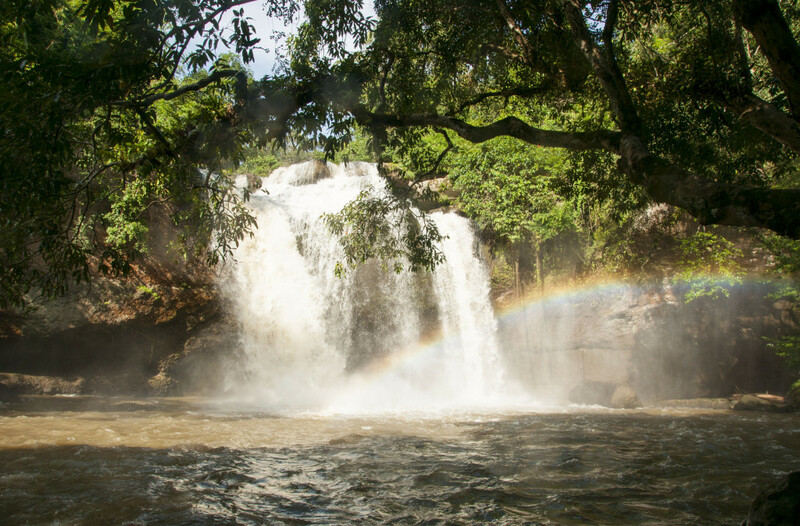 – The best time of the year to visit the waterfall is during the rainy season (May till October). The viewpoint where I saw a big herd of deer. A barking deer I found near the view point. This one is not scared of human at all. Beautiful grasslands in the park. Second day, I visited Haew Narok Waterfall น้ำตกเหวนรก which is the largest and highest waterfalls in the park. It is a three-tiered structure that extends 150 meters from the top tier to the basal lake. It is 23 kilometers from the gate on small road and lots of curves, but driving through the forest with the car window open feeling the fresh air and hearing the sound of nature was pleasant. From the car park, we have to walk one kilometer further with 200 stairs. It was a nice walk observing forest and listen to the birds although I couldn’t see them. You can get a glimpse of the vastness, with short trails for gentle walks, but with trainers, suitable gear, and an organised guide who knows where to go and what to look for this is a trip I definitely plan to revisit. Foreigner : Adult 400 Baht, Kid 200 Baht (If you have work permit/visa or a proof that you work and live here in Thailand, you can pay Thai price). Lovely resort I stayed, just 7 kms away from the park. There are hundreds of accommodations near the park for budget travelers as well as high end resorts with spa services and restaurants. I would suggest you to stay near Thanarad Rd. so you don’t need to travel too far to the park. (Five years ago I stayed at a resort situated one-hour away from the park without knowing, it was really tiring drive back and forth). If you like camping, camps tents can be rented for 150 or 225 Baht (for 2 or 4 people respectively) along with pillows, sleeping pads and a few other things. Showers and electricity available. 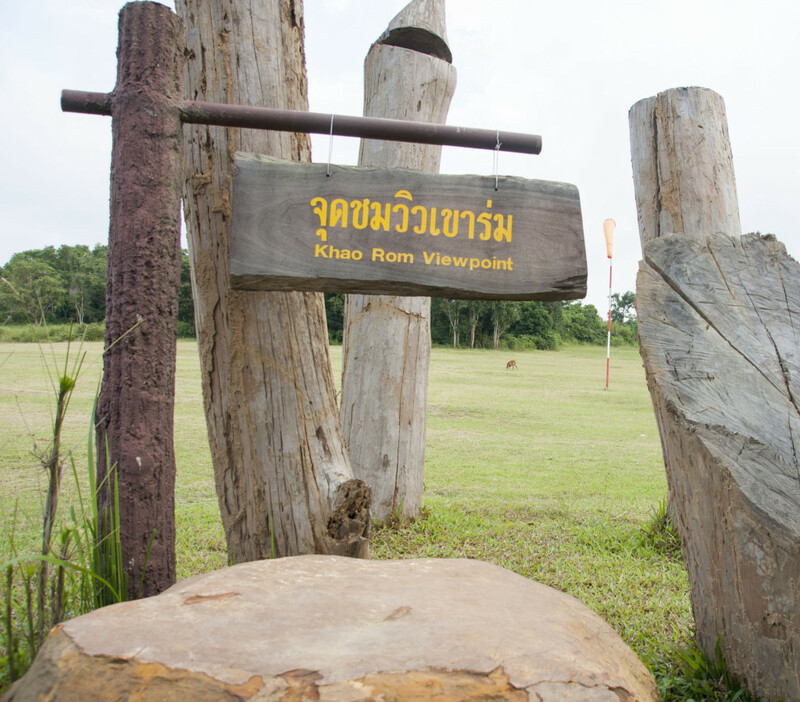 Khao Yai has two entrances. By far the busiest is to the north in Nakhon Ratchasima Province, with most travellers passing through the town of Pak Chong. The southern entrance is in Prachinburi Province. 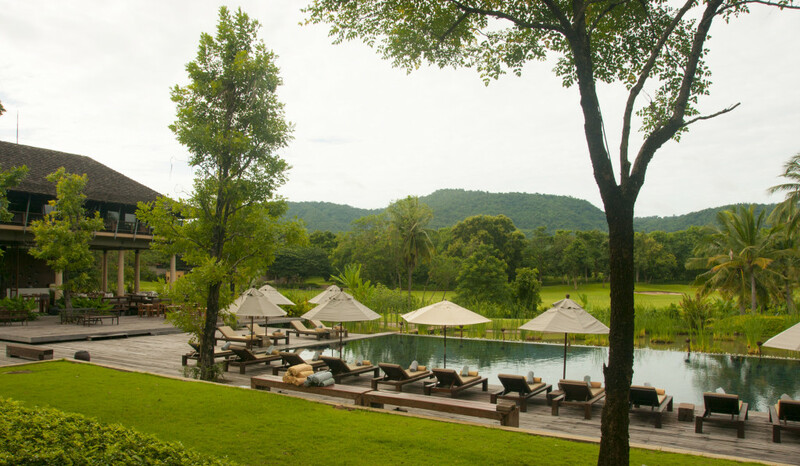 From Bangkok, Khao Yai is less than 3 hours by car. From Phahonyothin Road the quickest way [160 km] is to turn right at Rangsit Junction into Highway 305 [Rangsit to Nakhon Nayok]. Before arriving at Pranchinburi, switch left to Highway 33 at Naresuan Junction. Turn left on Highway 3077 that leads northwards another 41 km to the park headquarters. Take a bus from the Mo Chit bus station to Pak Chong which leave every20 minutes from 04.00am – 20.00pm. It takes about 2 hours and a half. In front of the 7-11 in Pak Chong trucks shuttle visitors to the gates. The only way to get around the park in caseyou don’t bring your own car is either to arrange a ride in advance from a tour agency, arrange for a park ranger to pick you up. From Bangkok get on an affiliated van at the Victory Monument. Fees for each passenger is 250 THB per trip. ** ‘Jamnong Van‘ has special service from Bangkok to your desired tourist attraction. You can hire a van. Return trip Pak Chong – Bangkok: The station is at The Home Tower building opposites with night market at Pak Chong intersection. The van will take off in every 1 hour during 05.00-19.00hrs. For a person who is not in a hurry and wish to take a classic view of Thai trains. There are trains from Hua Lampong train station to Pak Chong station every day. It takes around 5 hours. 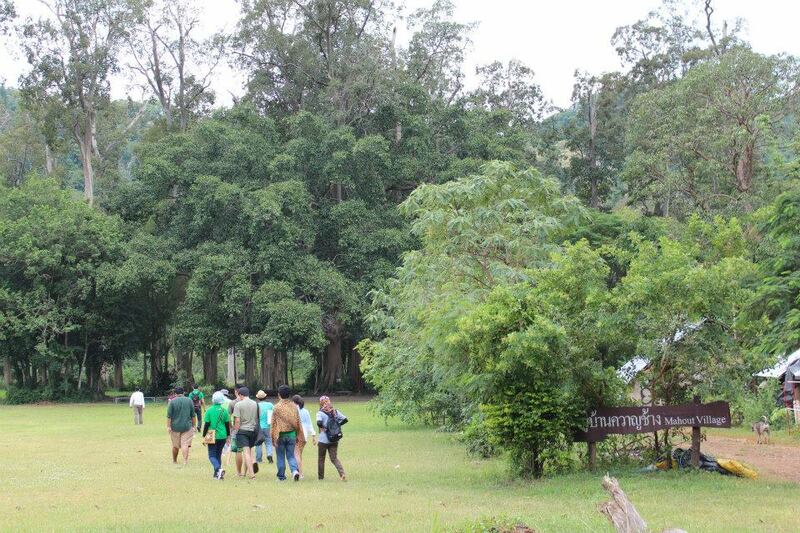 This nature trail starts from the km marker 33 and ends at Nong Pak Chi, the wildlife observing site. 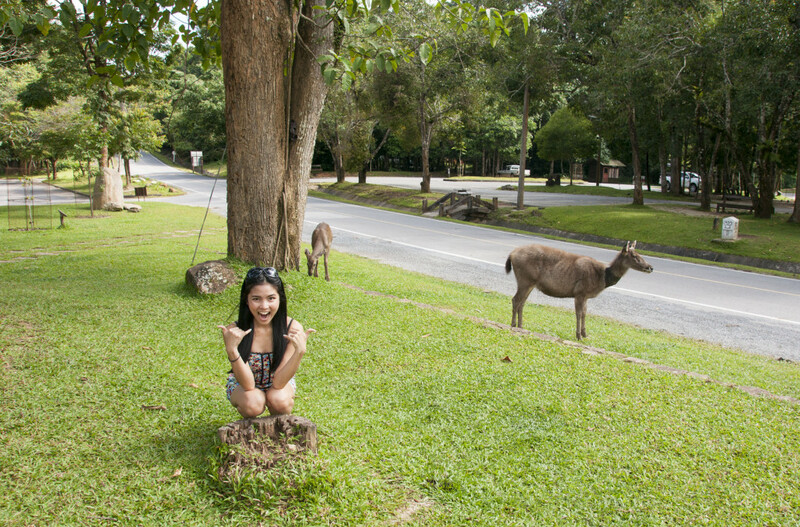 Have you visited Khao Yai National Park before? How did you enjoy it? 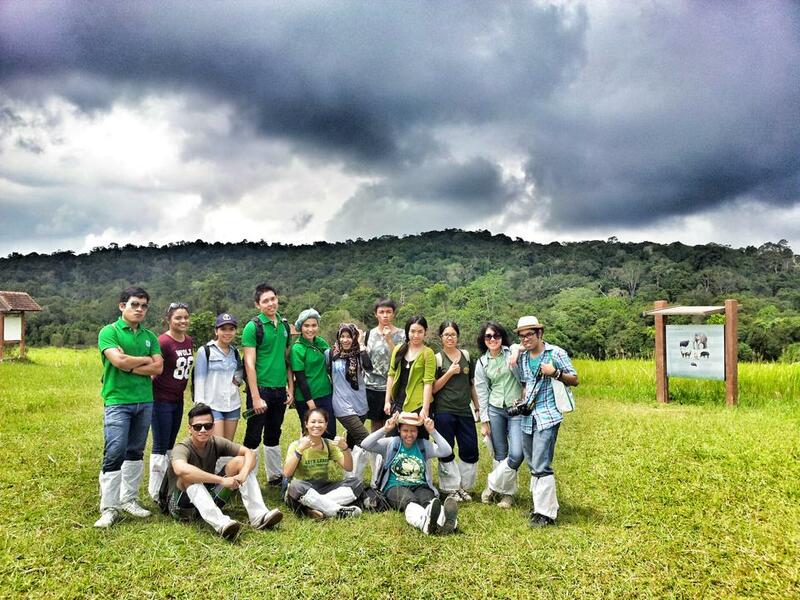 Last weekend, Mink my brother and his friends from Thailand State Alumni Community went to The Thai Elephant Research and Conservation Fund (TERF) in Khao Yai. It is an NGO based in on Thanarad road in Mu Si. In Thailand, wild elephants have suffered dramatic loss of forest habitat in the last century and are continuing to suffer from poaching, live capture and conflict with humans living on the edge of protected areas. In the past you might have seen elephants walking on the streets in some big cities mainly or the purposes of making money from tourists wanting to feed them, but thankfully this type of trade is disappearing now. You can do more by making a visit to the TERF in Khao Yai and enjoy an elephant ride, get informations about different conservation projects. Although I am looking at it after visiting the park but I liked the article and the way you managed your trip. Loved the place in 2days. Also there is a lot in the surrounding of the park. Love national parks and want to be there one day. Thanks for the post. It is inspiring. Thank you for visiting my website. I am happy to hear that you enjoyed the article. Thanks for yr sharing. I’m going to Khao Yai soon and readinf about your experience makes me very excited! I know its been a few years for your trip. But would you happen to know if we can take a train from Don Mueang station instead? This article is great because I haven’t been able to find such a complete overview about the park. After reading through what you wrote, I am sure that I will go there tomorrow. I can’t wait to see the wildlife and waterfalls. Also the plural of deer is deer, you do not need to add an s to the end. Thank you for comment. I will edit the mistake. Hope you had fun at the park. 400bht vs 40bht….LOL…3rd world mentality thai gov. Your article was very well written and very informative and I enjoyed reading it. Dear Mod, I was wondering if Aunt Jamnong Van might have a website or email address at which I can contact her? 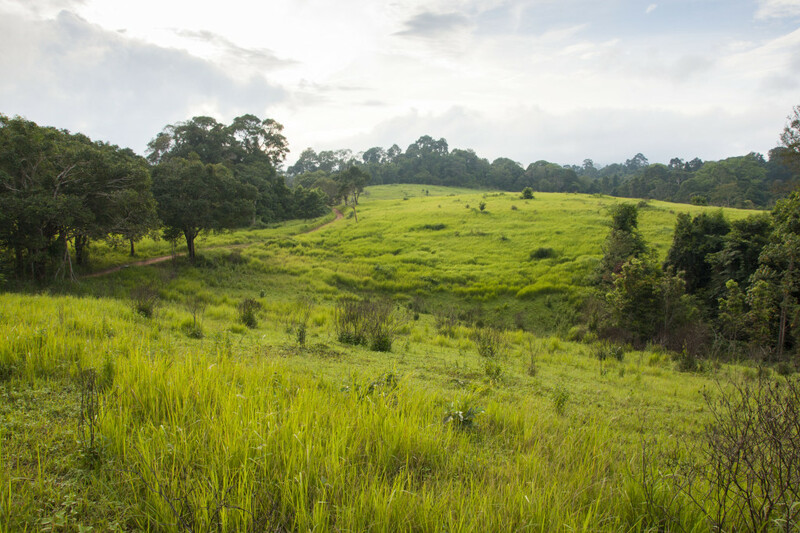 Thanks for a informative read on Khao Yai! Sawatdee ka Celeste, I am sorry if my post is not clear. The Aunt Jamnong Van contact is actually below the line ‘Aunt Jamnong Van’. Khao Yai is really great National Park, but the best National Park in Thailand in my opinion is Kaeng Krachan, once you are deep into the forest, no traffic at all, and you can barely see few tourists here and there. I was thinking of going to Khao Yai tomorrow but did not realize westerners pay as much as 400 Baht to get in. You indicated that foreigners with work permits pay the same as Thai nationals. I wonder if my education visa offers the same benefit? Also, do you really have to make arrangements with a tour guide to enjoy the park? I was hoping to just be able to wander around on my own, since I do not have a car. Looks like I may have to postpone the trip and perhaps rent a car. Either way, good post! I actually ended up going yesterday, so now I can answer my own questions: I was lucky and didn’t have to pay the farang entrance fee since I am in Thailand on an education visa. Also, I found out you can rent a motorbike in Pak Chong, which I did. So I rode my rental motorbike to the park, and inside the park. Unfortunately I only had about 3 hours inside the park since I had to return the motorbike by 6 pm as I was going back to Bangkok the same day, but it was a very nice experience, and I got to see some very beautiful scenery, elephants and other wildlife. Sawatdee ka Ralf, I am sorry I didn’t reply to your questions earlier. 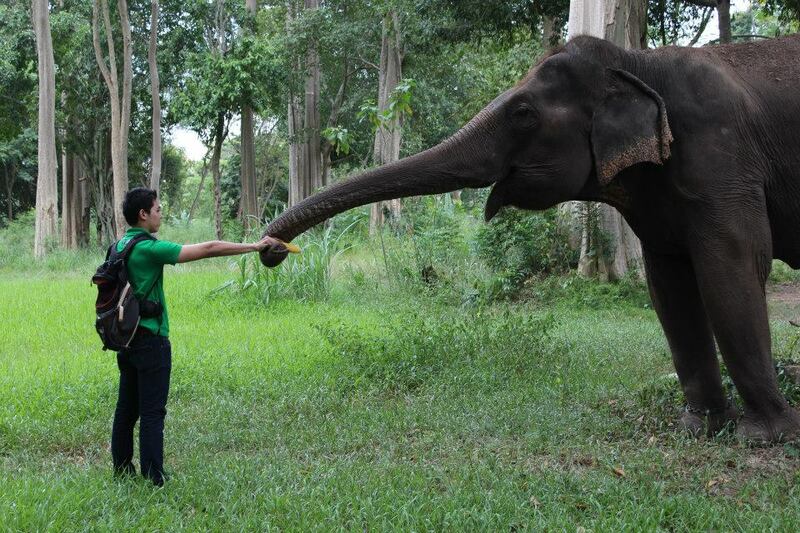 I am happy to hear that you enjoyed the park and paid the Thai price:) Anyway, you saw elephants!!! I didn’t and I wanted to see them so badly. I was in Khao Yai with my 2 kids in 2008. It was amazing to be there. We was hiking in the national park with a local ranger. We saw many different animals, and my kids took a bath in Haew Suwat Waterfalls. We came with train from Ayuttaya to Khao Yai, and I will recommend the train tour and also the Khao Yai national park. I was an amazing journey in a amazing country. Wow, this was awesome! I really enjoyed hearing about your adventure, and I would love to see this park for myself some day. Khob khun khrap! Your article is good. The park looks great in your photos. You take a pretty good photo yourself. You really got some good shots in short order. Mod you bring an enthusiasm to everything you do that makes all your writing and videos fun. Plus they are well planned and well executed. Planning to visit Bangkok in October, and will definitely think about heading to this National Park. Need to get back to studying my Thai. 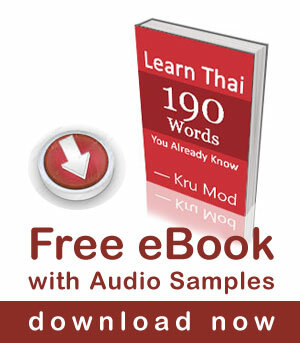 I’m tempted by the private Thai lessons idea. I’ll keep thinking. Sawatdee ka Mike, thank you for your kind comments. I am happy to hear that you liked my videos and article. 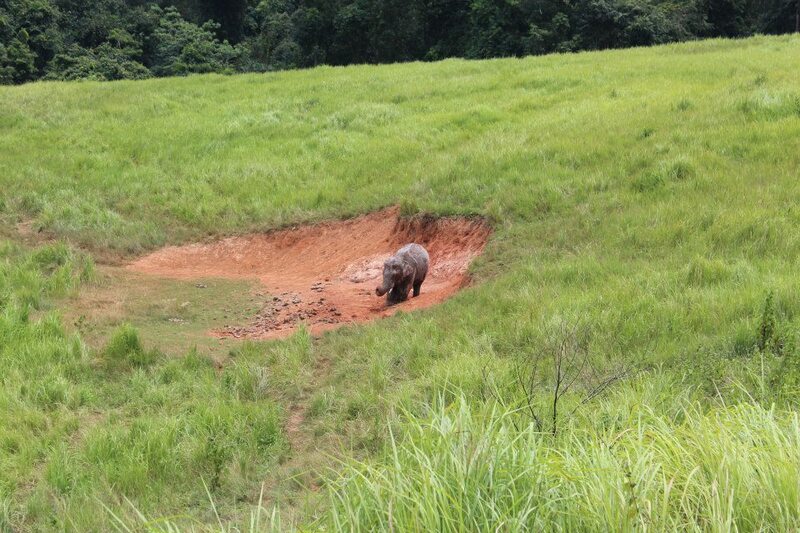 Hi Mod I enjoyed your article and pictures of Khao Yai, I visited the park back in 2008 and what a beautiful place. 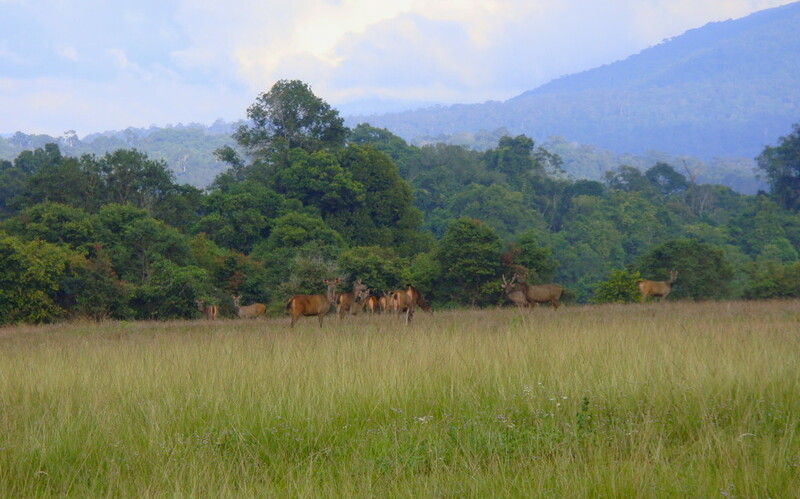 When I went there I was told that I may see wild elephants but I was a bit disappointed that I missed out on seeing any on the trip, although there were plenty of barking deer, a couple of porcupines, many different types of birds and so many monkeys. 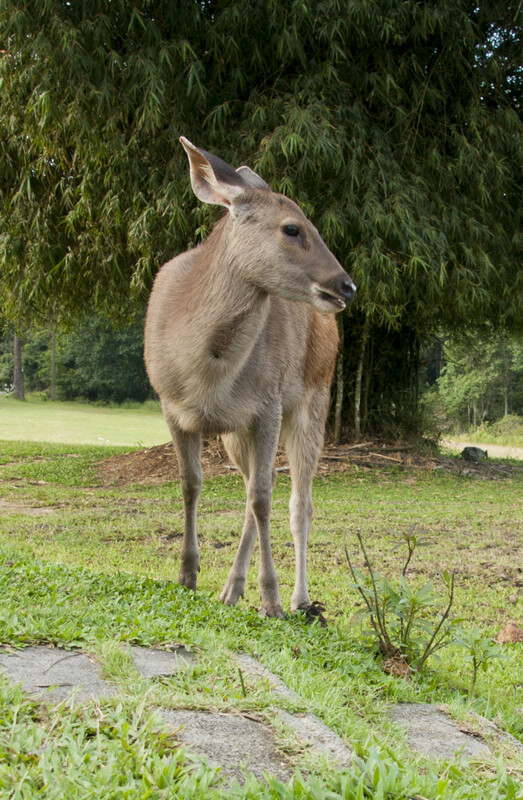 We stayed in a cabin near a small lake and there were so many barking deer that had no fear of humans. The cabin was fantastic in the early morning a mist rolled over the lake and it looked so enchanting. 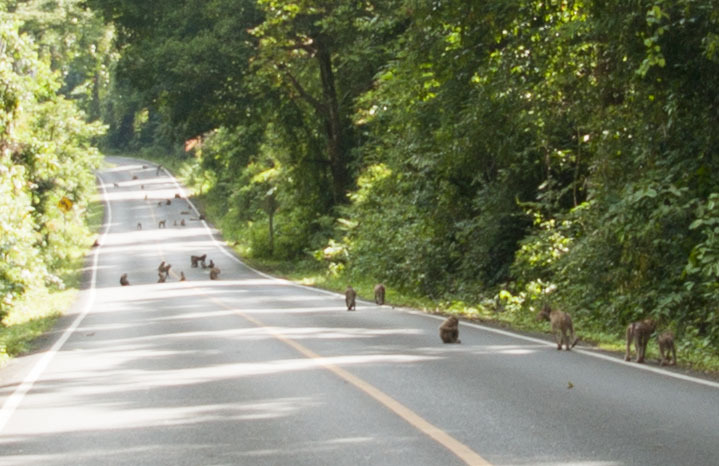 The monkeys on the road in Khao Yai were quite an experience as well and hope some day that I make it back there. Wow! this is such a nice article and helpful I shall be sure to visit there when next in the area. I live in Koh Samui so it is quite faraway. Thank you very much dear teacher. This brings back memories. On my first trip to Thailand (in 1985) I visited this beautiful area. The place is still worthwhile to visit as it has not changed too much. 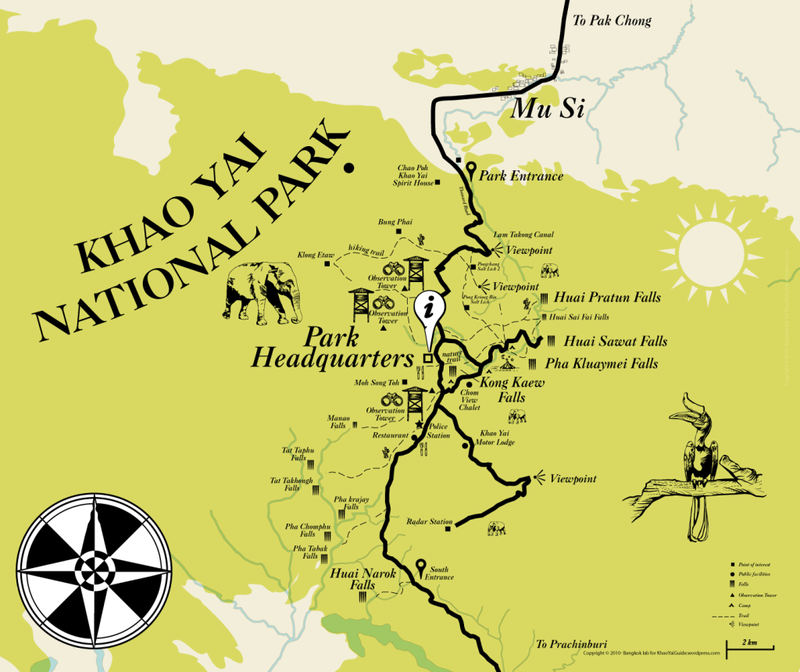 Thanks for the great info about Khao Yai National Park! I was at Erawan a few years ago, and that was nice, but Khao Yai is a must on my next trip. Thanks for great lessons too Mod! I follow your videos and have learned a lot.